Alison Brysk, the Mellichamp Professor of Global Governance in the Department of Global Studies at UC Santa Barbara. Though most of us agree with the noble goals of human rights campaigns, there are many competing opinions about how to best organize an effective social movement. And Alison Brysk has heard them all. 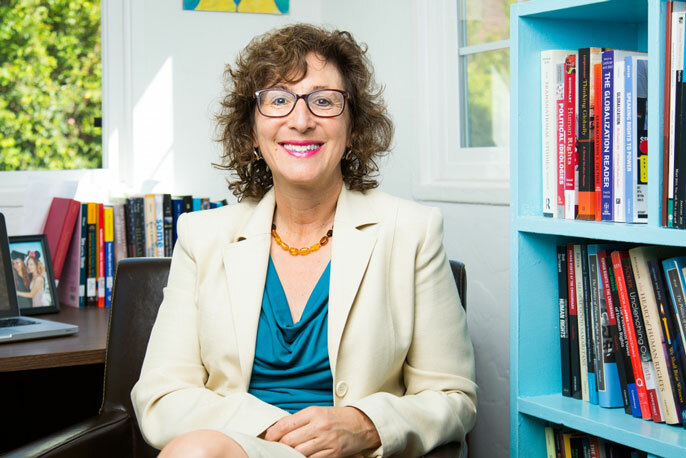 A preeminent scholar working in the field of human rights policy and practice, the UC Santa Barbara professor has written or edited 10 books and published numerous papers and articles about effective strategies for creating large-scale social change. In more than two decades of research into human rights issues, from torture to trafficking, she has learned not only what makes a human rights crusade successful, but also how a regional injustice can become an international cause that eventually leads to lasting global change. “This award signifies leadership of a community of scholars, which is incredibly gratifying,” commented Brysk, who is also interim chair of UC Santa Barbara’s global and international studies department. “It’s bigger than me, and it recognizes the power of the pen to save people’s lives.” Brysk, who has watched the field of human rights scholarship grow immensely over the past 25 years, is also a past recipient of a Woodrow Wilson Fellowship and of two Fulbright awards. Brysk said she is especially proud of her work with doctoral students in the U.S. and abroad, and considers herself a “global mentor.” She has taught all over the world —Spain, India, Sweden, Austria — and has twice participated in a training program for Latin American indigenous community leaders sponsored by the United Nations. Many of her graduate student mentees have gone on to publish books and to work in the field of human rights and social issues. “To me, mentorship is nurturing and accompanying students on the academic journey of producing human rights scholarship that expands our knowledge and our vision of the field,” explained Brysk. “Part of what I am trying to do in teaching and mentoring is to foster global citizenship.” She challenges her students to place their research in a historical trajectory and to appreciate and question global context. As for her own role in worldwide human rights struggles, Brysk said she believes deeply in the importance of thoughtful scholarship on social issues. “Though I am supportive of social movements, I see the value of my role in doing a good and careful analysis of useful approaches to the problem and providing that to the organizations,” she said, describing the unique difficulty of having a front row seat to many of the world’s injustices.